President Rodrigo Duterte couldn’t help but invite freed Norwegian hostage Kjartan Sekkingstad to go sightseeing in the Philippines first before heading home to Scandinavia. However, Duterte joked that Sekkingstad should just do so in Davao City where he can assure his safety. 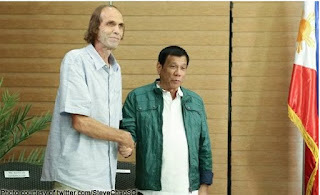 Sekkingstad, who spent a year under hostage by Abu Sayyaf Group (ASG) bandits, was presented by Duterte to the media Sunday night (September 18) in Davao. The foreigner was freed Saturday afternoon. “He’s going to just stay behind. Maybe just…ah he’s also leaving?” Duterte said of Sekkingstad. The President was apparently surprised to learn that the latter was going to leave the country that same evening with the Norwegian ambassador. “You may want to go around but near my city. 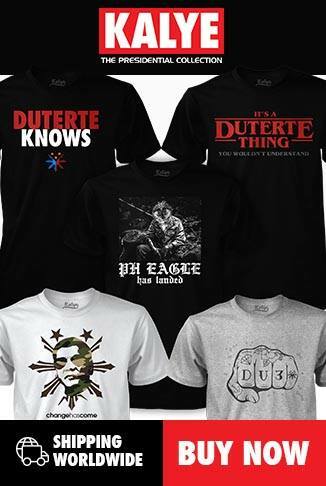 Not in those islands because I don’t have control over those,” Duterte said, eliciting some laughter. Sekkingstad, 56, was kidnapped by the bandits at the Holiday Oceanview Samal resort on Samal Island in the province of Davao del Norte in September 2015. Sekkingstad is the resort manager. Two of his three fellow captives were beheaded after their ransom demands weren’t met.